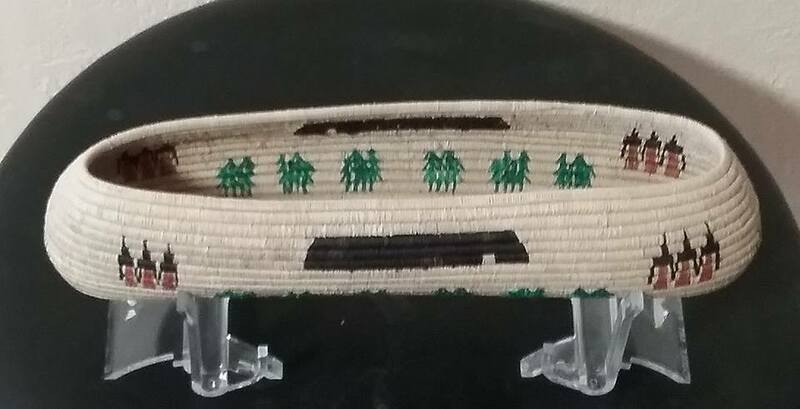 9 1/4" Coil Canoe Basket called "Keepers of the Fire"
The Forest where they lived, and the Plants on the ends of the Basket for weaving materials. 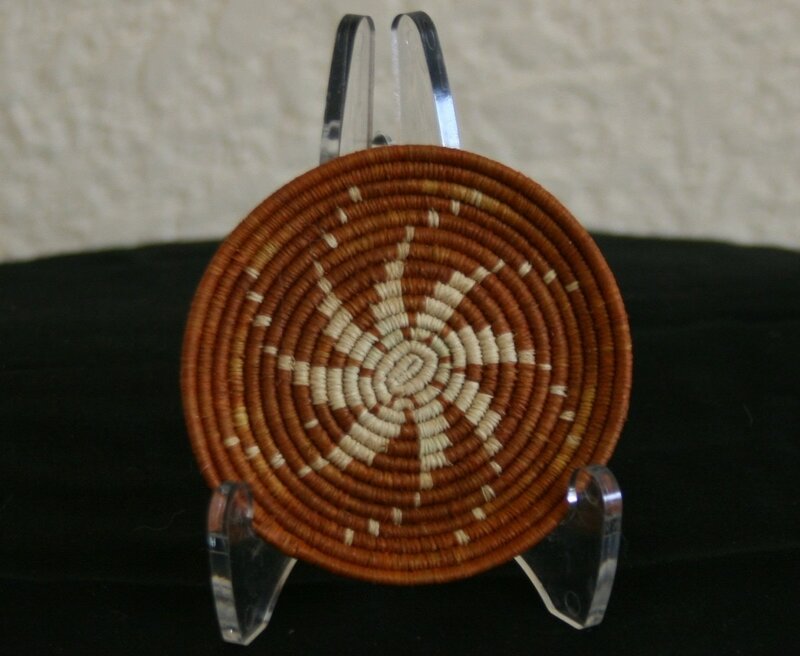 This Coil Basket is woven with a figure 8 locking stitch. It is constructed with Basket Reed ( the core of Rattan ), and Raffia ( a Palm Leaf ). 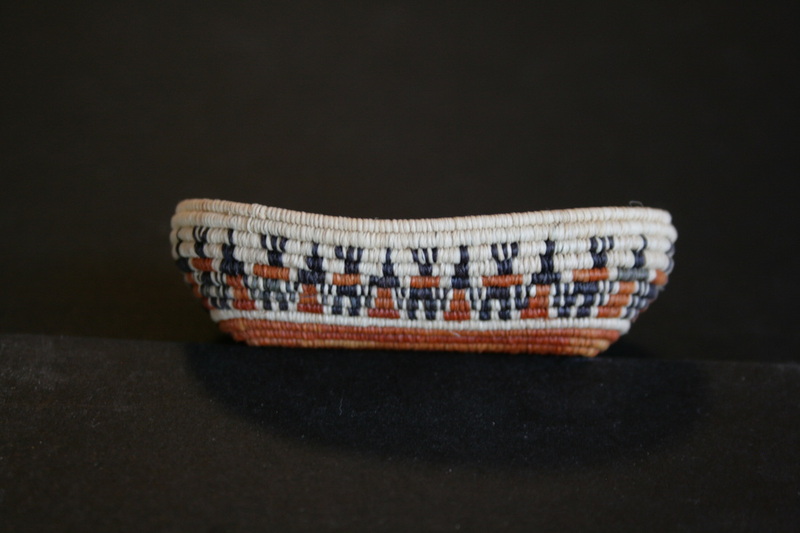 This Coil Canoe Basket measures 9 1/4" long, by 3" wide, by 2" deep. on August 16 - 19, 2018, in the hall near the lounge. Otherwise you may email me for more information at darleneryer23@yahoo.com . Thank You! This is a one stick plate basket that measures 10" in dia. It is made from basket reed (the core of rattan), and raffia (a palm leaf). It is a coil basket done with a figure 8 locking stitch, which means that every row, except the final row, are double stitched. 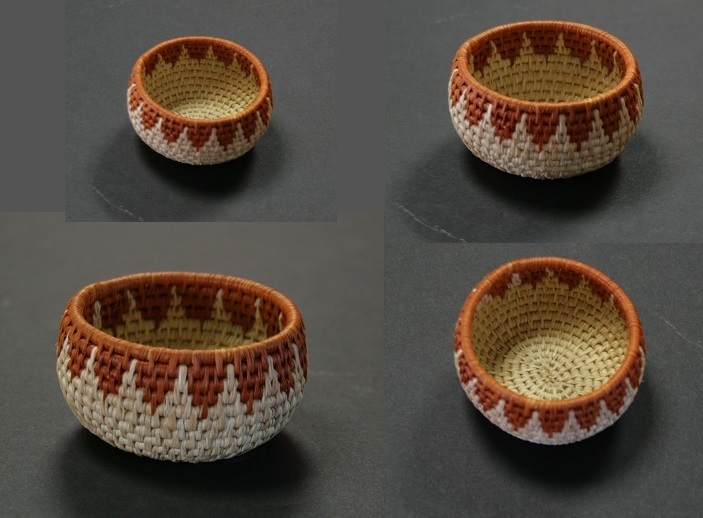 The design is called "Ancient Arrowheads", and is stitched in while making the basket, without a pattern. The number of this little piece is #D-1080, and it sells for $1,500.00 . If interested in purchasing this treasure, please email me at darleneryer23@yahoo.com . Thank You. This is a one stick mini bowl basket that measures 1" in dia. by 5/8" tall. It is made from basket reed (the core of rattan), and raffia (a palm leaf). It is a coil basket done with a figure 8 locking stitch, which means that every row, except the final row, are double stitched. 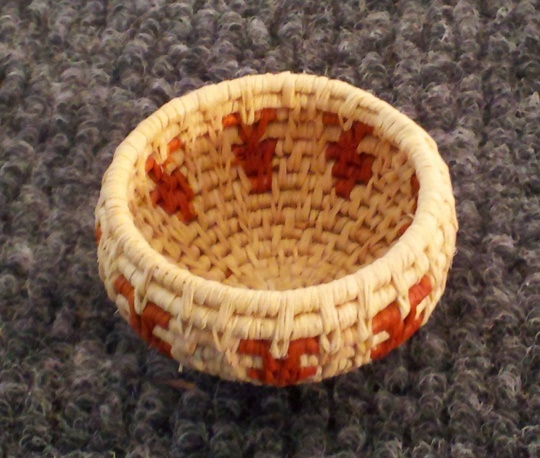 The design is called "Ancient Arrowheads", and is stitched in while making the basket, without a pattern. The number of this basket is #D-1084, and it sells for $110.00. If interested in purchasing this beauty, please email me at darleneryer23@yahoo.com . Thank You. This is a one stick mini bowl basket that measures 1" in dia. by 5/8" tall. It is made from basket reed (the core of rattan), and raffia (a palm leaf). It is a coil basket done with a figure 8 locking stitch, which means that every row, except the final row, are double stitched. 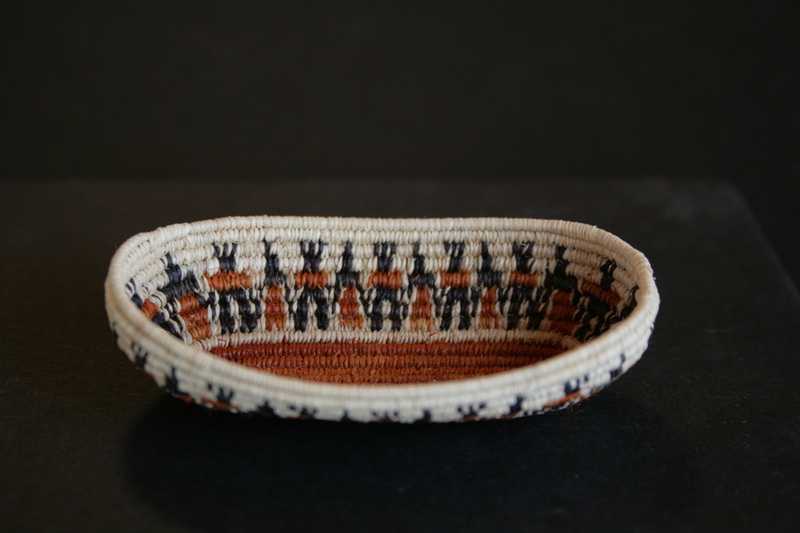 The design is called "Coyote Tracks", and is stitched in while making the basket, without a pattern. The number of this basket is #D-1083, and it sells for $110.00. If interested in purchasing this beauty, please email me at darleneryer23@yahoo.com . Thank You. This is a one stick mini plate basket that measures 1 1/4" in dia. by 7/8" tall. It is made from basket reed (the core of rattan), and raffia (a palm leaf). It is a coil basket done with a figure 8 locking stitch, which means that every row, except the final row, are double stitched. 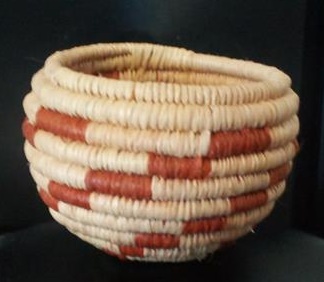 The design is called "Lightening", and is stitched in while making the basket, without a pattern. The number of this basket is #D-1078, and it sells for $110.00. If interested in purchasing this beauty, please email me at darleneryer23@yahoo.com . Thank You. This is a one stick mini plate basket that measures 1 1/4" in dia. by 7/8" tall. 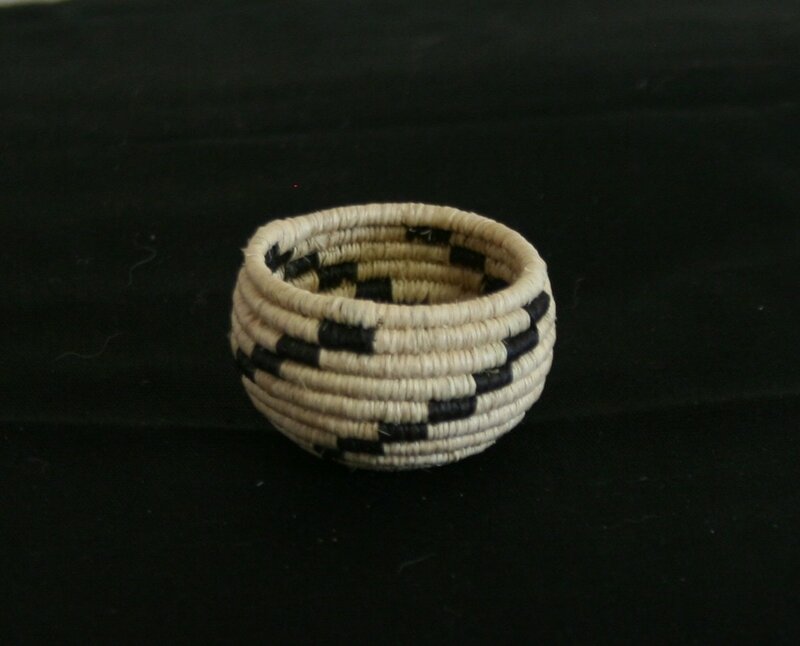 It is made from basket reed (the core of rattan), and raffia (a palm leaf). It is a coil basket done with a figure 8 locking stitch, which means that every row, except the final row, are double stitched. 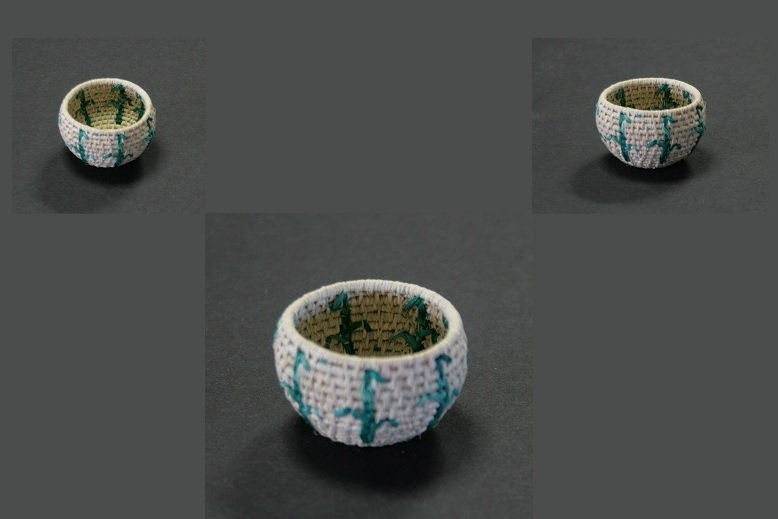 The design is called "Lightening", and is stitched in while making the basket, without a pattern. The number of this basket is #D-1077, and it sells for $110.00. If interested in purchasing this beauty, please email me at darleneryer23@yahoo.com . Thank You. This is a one stick mini plate basket that measures 2 1/4" in dia. It is made from basket reed (the core of rattan), and raffia (a palm leaf). It is a coil basket done with a figure 8 locking stitch, which means that every row, except the final row, are double stitched. The design is called "Spinning Star", and is stitched in while making the basket, without a pattern. The number of this basket is #D-1081, and it sells for $130.00. If interested in purchasing this beauty, please email me at darleneryer23@yahoo.com . Thank You. This is a one stick mini plate basket, that measures 2 7/8" in dia. It is made from basket reed (the core of rattan), and raffia (a palm leaf). It is a coil basket done with a figure 8 locking stitch, which means that all rows except the final row, are double stitched. The design is called "Bear and Pine Tree", and is stitched in when making the basket, without a pattern. The number of this basket is #D-1082, and it sells for $150.00. If interested in the purchase of such a fine little gem, please email me at darleneryer23@yahoo.com . Thank You. This Amazing Collaborative Mixed Media Piece is called "Thundering Spirits". It measures: 4 5/8" tall, by 11" in diameter. It is constructed of Bronze, Basket Reed, & Raffia. The design was created by Darlene Ryer, and sculpted by Rudolf Cavalier. The 7 Buffalo are done in a Patina we created ourselves, and then the piece is Polished to a Mirror Finish. 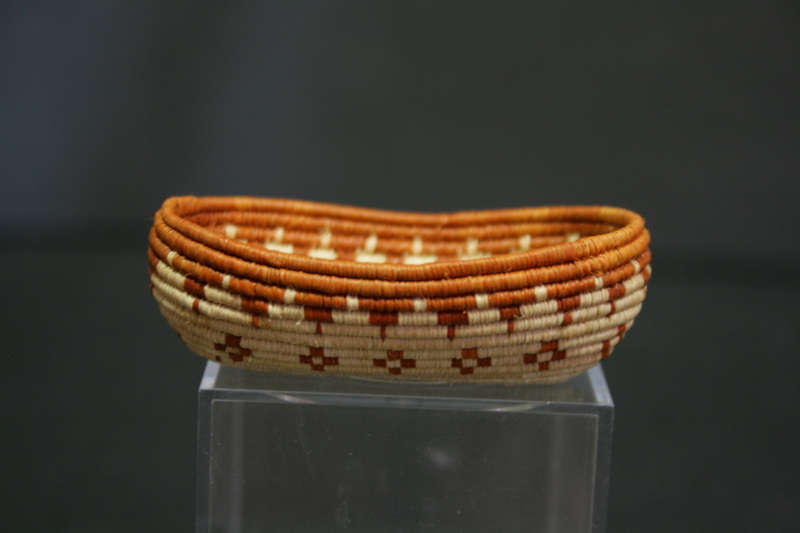 Next the piece is Sealed with a Bronze Acrylic Lacquer, to protect the finish, and then the rim was Woven by Darlene Ryer, in a Three Stick foundation, with a Figure 8 Locking Stitch in the Raffia. (Darlene) darleneryer23@yahoo.com ,or (Rudolf) RCDART59@yahoo.com . Thank you. This ^ is a One Stick Coil Plate Basket. 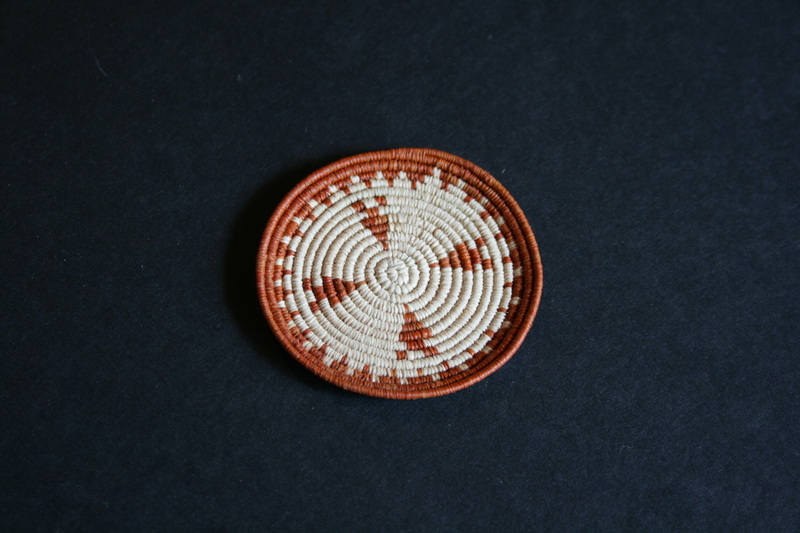 This Basket is woven in a figure 8 stitch, with Tan and Rust Raffia over Basket Reed. Raffia is a Palm Leaf, and the Basket Reed is the core of Rattan. The pattern on this lovely piece is called 6 point Spinning Star. This Basket Measures 2 7/8" in dia., by 1/4" deep. This Basket has 48 stitches to the inch horizontally, and 12 rows to the inch vertically. The number on this Basket is #1049, and it is still available for purchase. If interested in this Beautiful Plate Basket, please email me at darleneryer23@yahoo.com . The price of this piece is $275.00. Thank you. This ^ is a One Stick Mini Canoe, Coil Basket. 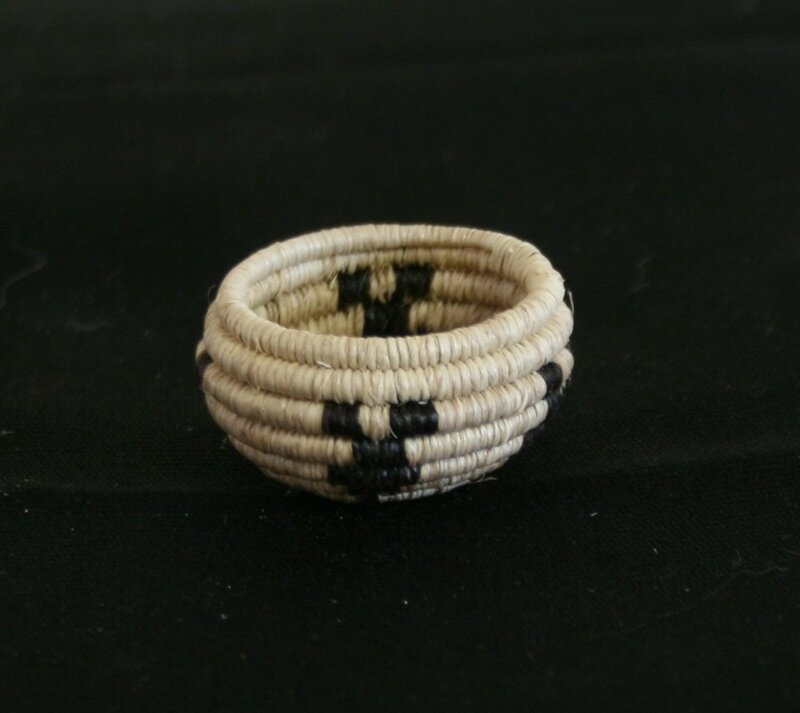 This Basket is woven in a Figure 8 Stitch, with Tan, Black, and Rust Raffia over Basket Reed. Raffia is a Palm Leaf, and the Basket Reed is the core of Rattan. The pattern on this lovely piece is called Friendship Dance. This Basket measures 2 7/8" long, by 1 3/4" wide, by 3/4" deep. This Basket has 40 stitches to the inch horizontally, and 11 rows to the inch vertically. The number of this Basket is #1073, and it is still available for purchase. If interested in this Beautiful Canoe Basket, please email me at darleneryer23@yahoo.com . The price of this piece is $375.00. Thank you. This ^ is a One Stick Coil Plate Basket. 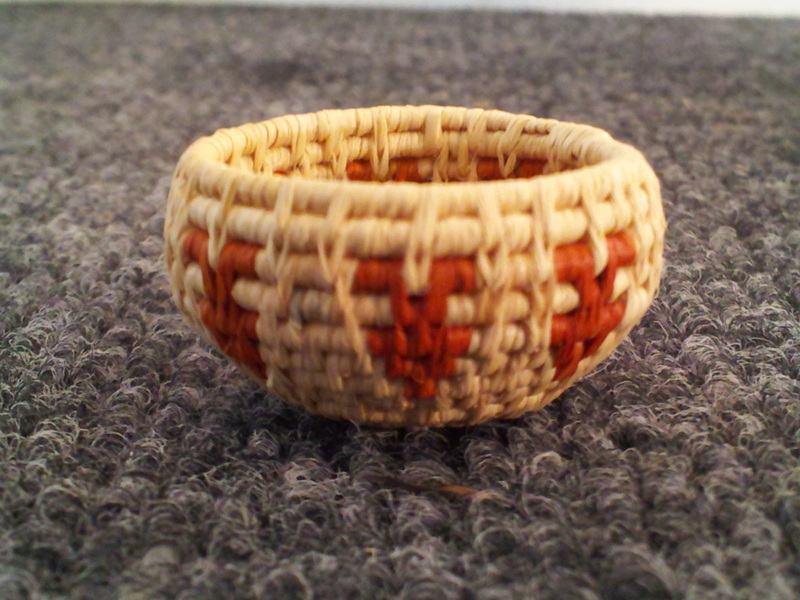 This Basket is woven in a figure 8 stitch, with Tan and Rust Raffia over Basket Reed. Raffia is a Palm Leaf, and the Basket Reed is the core of Rattan. The pattern on this lovely piece is called Pine Tree and Ancient Arrowheads. This Basket Measures 2 1/4" in dia., by 1/8" deep. This Basket has 48 stitches to the inch horizontally, and 12 rows to the inch vertically. The number on this Basket is #1074, and it is still available for purchase. If interested in this Beautiful Plate Basket, please email me at darleneryer23@yahoo.com . The price of this piece is $125.00. Thank you. This ^ is a One Stick Coil Bowl Basket. 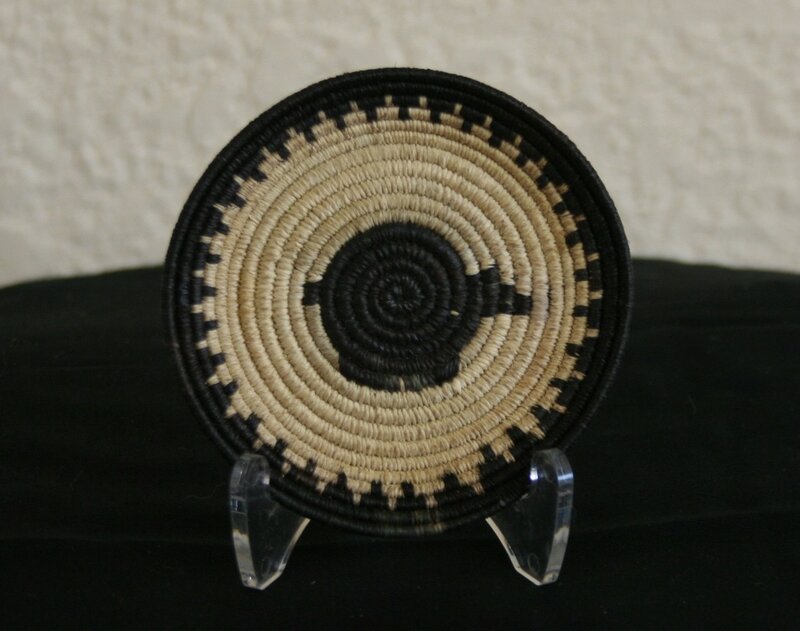 This Basket is woven in a figure 8 stitch, with Tan and Black Raffia over Basket Reed. Raffia is a Palm Leaf, and the Basket Reed is the core of Rattan. 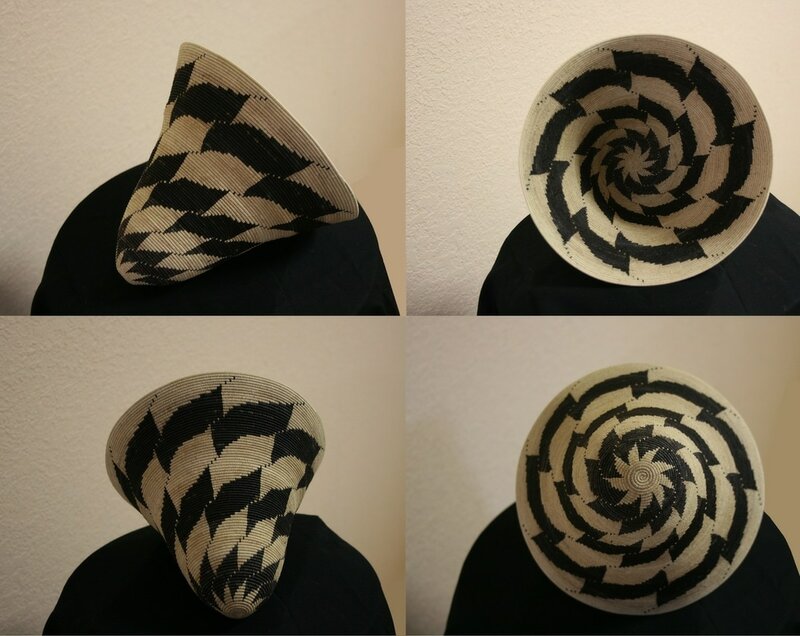 The pattern on this lovely piece is called Tornados and Ants. This Basket Measures 3 1/2" in dia., with a 2" opening, by 2 7/8" deep. This Basket has 48 stitches to the inch horizontally, and 10 rows to the inch vertically. The number on this Basket is #1027, and it is still available for purchase. 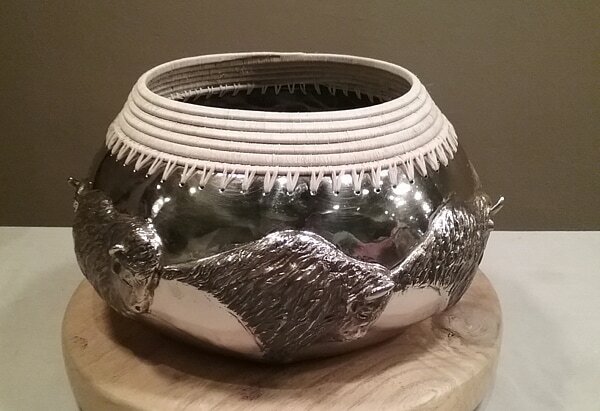 If interested in this Beautiful Bowl Basket, please email me at darleneryer23@yahoo.com . The price of this piece is $800.00. Thank you. This ^ is a One Stick Mini Canoe, Coil Basket. 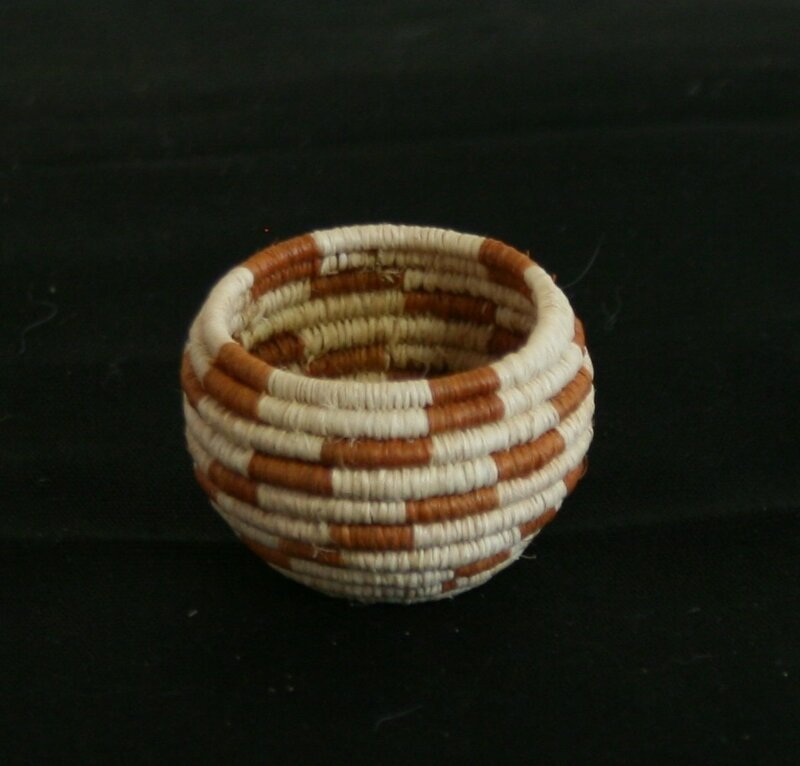 This Basket is woven in a Figure 8 Stitch, with Tan and Rust Raffia over Basket Reed. Raffia is a Palm Leaf, and the Basket Reed is the core of Rattan. 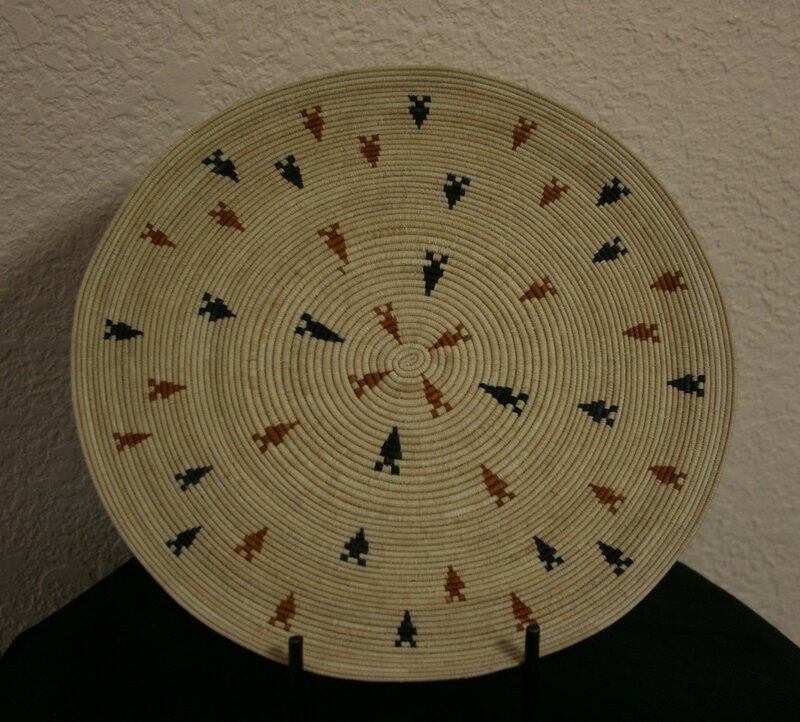 The pattern on this lovely piece is called Pine Tree and Coyote Tracks. This Basket measures 2 3/4" long, by 1 5/8" wide, by 7/8" deep. 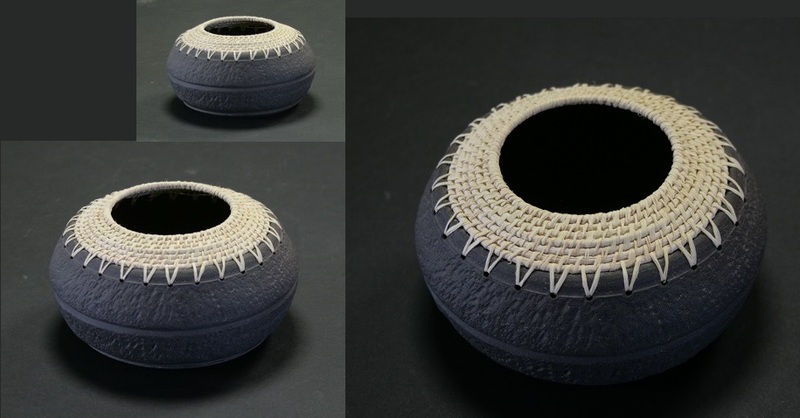 This Basket has 46 stitches to the inch horizontally, and 13 rows to the inch vertically. The number of this Basket is #1072, and it is still available for purchase. 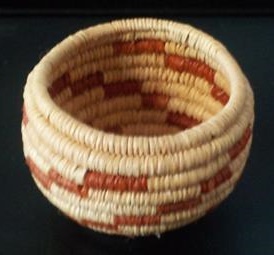 If interested in this Beautiful Canoe Basket, please email me at darleneryer23@yahoo.com . The price of this piece is $275.00. Thank you. 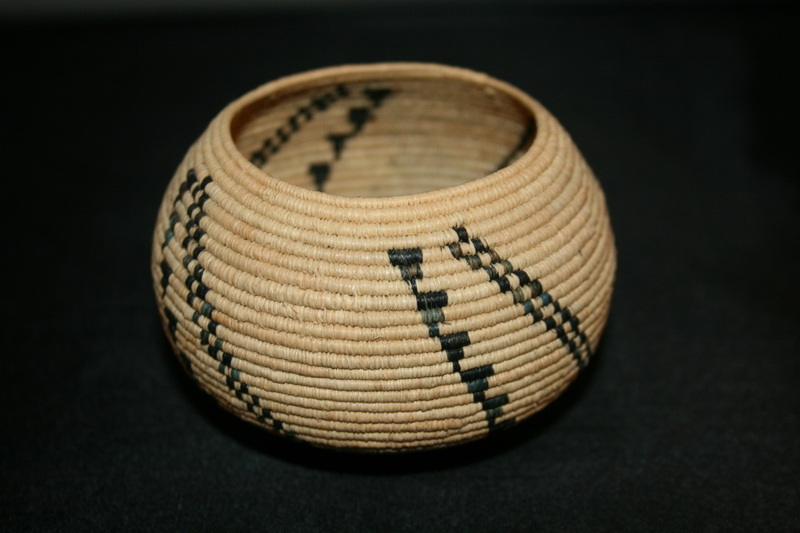 This ^ is a Clay Basket, which consists of a Hand Thrown Clay Body, with a Woven Rim. It is a high fired pot that I threw on a wheel, back in the year 2000. 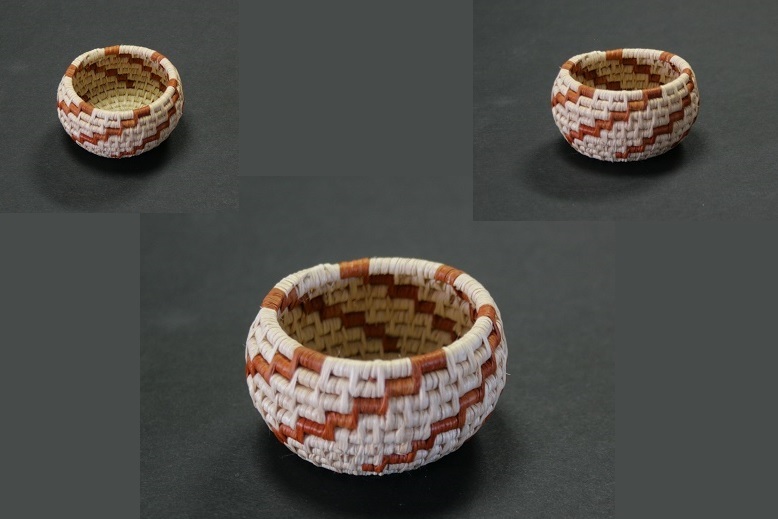 This week (2-25-2014) I wove the rim with Basket Reed, and Tan Raffia. Basket Reed is the core of Rattan, and Raffia is a Palm Leaf. I love the combination of natural materials, and the hand texture I did on this bowl. The number on this Clay Basket is # D-1065, and it is still available for sale. The price on this unique piece is $85.00. It measures: 5 1/4" in diameter, by 2 3/4" deep. If you are interested in purchasing this lovely piece, please email me at: darleneryer23@yahoo.com . Thank You. 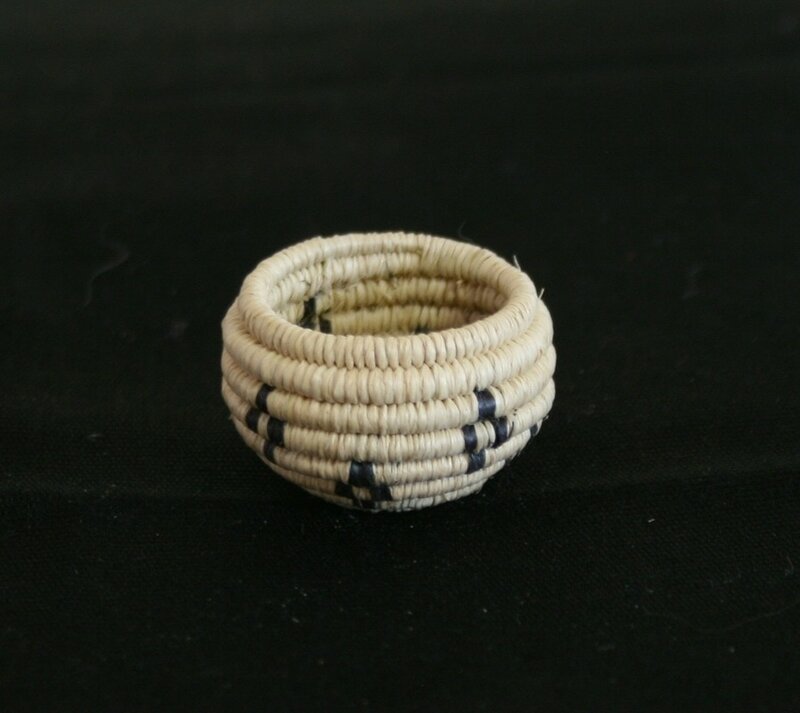 This ^ is a One Stick Double Mini, Coil Basket. This Basket is woven in a Skip Stitch, with Tan and Rust Raffia over Basket Reed. Raffia is a Palm Leaf, and the Basket Reed is the core of Rattan. The pattern on this lovely piece is called "Lightening". This Basket measures: 1 7/8" in diameter, by 1 1/8" deep. There are 20 stitches to the inch horizontally, and 8 rows to the inch vertically. The Number of this Basket is: #D-1063, and it is currently for sale. The price for this beautiful piece is $115.00. For inquiries, please email me at darleneryer23@yahoo.com .